course evaluations posted online. Oh my little students, I take back most of my earlier bitching! Oh sure, it's nice that you liked me, but what really warms my heart is that you thought my class was difficult and challenging and still you loved it! And you got it - your comments are full of descriptions of how hard you have to work but how important statistics is to public health research. You really were listening when I opened my mouth! I am so pleased (and a tad pleasantly surprised, to be honest). 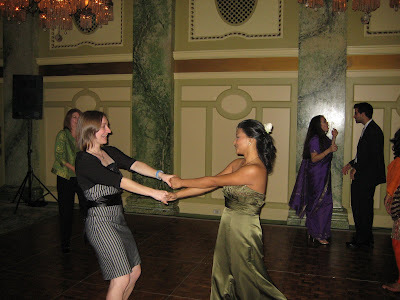 We're still waiting on the 'official' wedding photos, which will likely show The Dress full on, but for those of you who have been asking how it all went, here's my favorite photo of me dancing with my new sister-in-law. That's what our tree looks like. Dad went nuts over new(-ish) LED xmas lights, so the whole tree is now chock full of fading and blinking and perpetually changing neon colors. It's ok, but whoa. If at any point this holiday I drink a bit too much the tree may definitely make me nauseous. I know it's petty, but it annoys me when people refer to the thing I'm writing as a thesis. In my world a thesis is what you write to earn a Masters and a dissertation is what you write to complete a PhD. A thesis contains enough information to produce one peer-reviewed publication and may be a slightly novel twist on an existing idea. A dissertation contains enough information to produce at least three peer-reviewed publications and is some totally new idea that sprang from your brain (or, more realistically, that sprang from your advisor's brain and you acted on). I know in many other areas the two words are used interchangeably, and I know it shouldn't matter, but it annoys me. I'm bracing myself for a bit of a lean patch in early spring (visa bill + taxes + misc tuition/registration fees; all of which are in the budget, but will eat into savings a bit) but once I get through that I will be entering the least-poor phase of my adult life. It's weirdly timed with the rest of the world - hearing non-stop how everyone is tightening their belts and here I am envisioning all the things I'll be able to afford, for the first time ever. I'm equal parts smug, relieved, and guilty. I love the holidays. I love the whole month of December - 31 days that include my birthday, my Mom's birthday, Christmas, my brother's birthday, and New Year's Eve. Growing up it was basically 31 days of partying and baking and eating. But the last week or two has mostly been me workingworkingworking and when I do come up for a breath it's hard to get into the spirit of things. Oh sure, I hung the stockings and strung some lights and I've been indulging in rum-laced-eggnog for the last few nights. But I haven't really been present. Then finally, today, as I marked 'write' off my To Do List, thus marking the last bit of work until eight days from now, and an instrumental version of 'Angels We Have Heard on High' played on the radio, it happened. I was able to sense the moment a few days from now when I'll be sitting in church singing, the smell of the tree in our house, the not-quite-traditional Christmas music we'll play for days while making cookies and decorating the tree and wrapping presents. It's here! And I'm headed home. Departure for airport in just under 60 minutes.